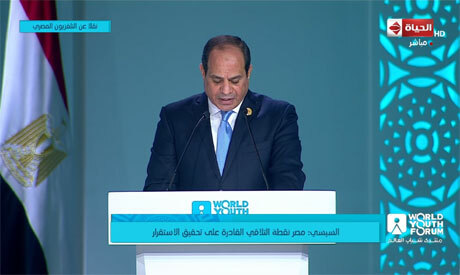 Egypt will be adopting a declaration to “preserve life and combat terrorism” as a fundamental right, President Abdel-Fattah El-Sisi said on Tuesday at the closing ceremony of the World Youth Forum (WYF) in South Sinai's Sharm El-Sheikh. El-Sisi also said he will mandate the National Training Academy with training 10,000 African and Egyptian youths in fields of economy, society, and politics. El-Sisi said that the state will prepare a major advertising campaign to raise awareness among young people about water scarcity. Egypt's parliament issued the 89-article NGO law in November 2016 and it was ratified by El-Sisi in May 2017. The law has garnered criticism from civil society in Egypt because some of its provisions limit the activities of NGOs. El-Sisi's comments about the NGO law come a few days after he first made the announcement when the issue was raised for discussion by a participant in the WYF, who suggested that the law be amended. "We rely on the enthusiasm of our youth and their belief and love amid conflicts and separation," El-Sisi said, adding that this year's forum was a chance to create dialogue between youths worldwide. He described Egypt as a "meeting point" to achieve stability, and thanked everyone who participated in the forum, as well as the organisers and the people of Sharm El-Sheikh for their hospitality. "This is proof that dialogue can turn recommendations into tangible reality," he said.